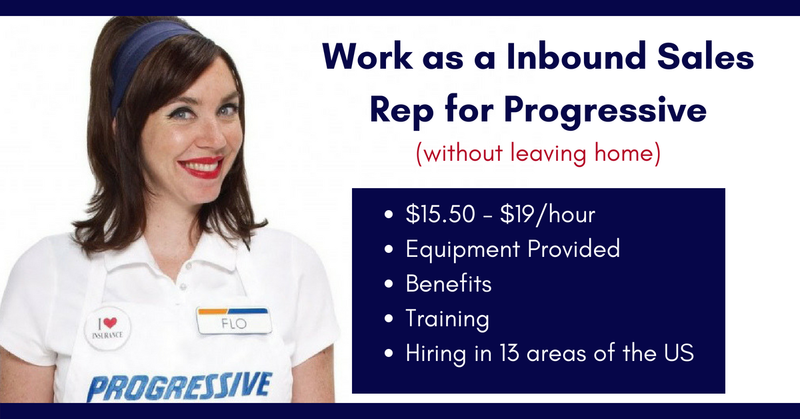 Progressive, one of the largest providers of car insurance in the United States, is now hiring work from home Inbound Sales Representatives. The pay is $15.50 – $19 an hour, the company provides all of the equipment you’ll need, and training is paid and virtual. We are seeking those that have an active insurance license to join our team as a inbound sales rep working remotely from your home. On our team, you’ll be taking inbound calls from customers interested in buying insurance. NO COLD CALLING! We’ll provide you with office equipment and training virtually so that you can feel confident you’re providing the best possible customer service while still in a work from home environment. As the voice of Progressive to our customers, you’ll explain policy coverage and sell insurance products and services. You’ll have the support of a virtual, collaborative team, which includes ongoing coaching and development. $500 Property & Casualty or Personal Lines license sign-on bonus! To be the first to hear about work from home jobs and side gigs, like our Facebook page and check your feed for our posts. Good luck in your work from home plans! This entry was posted in Hiring Companies, Work at Home Jobs and tagged Progressive, Promote. Bookmark the permalink.